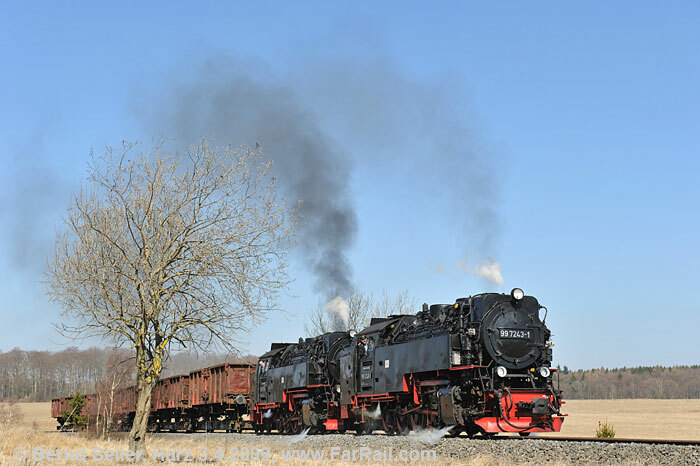 The ‘Deutsche Reichsbahn’ Returns to the Harz Mountains! 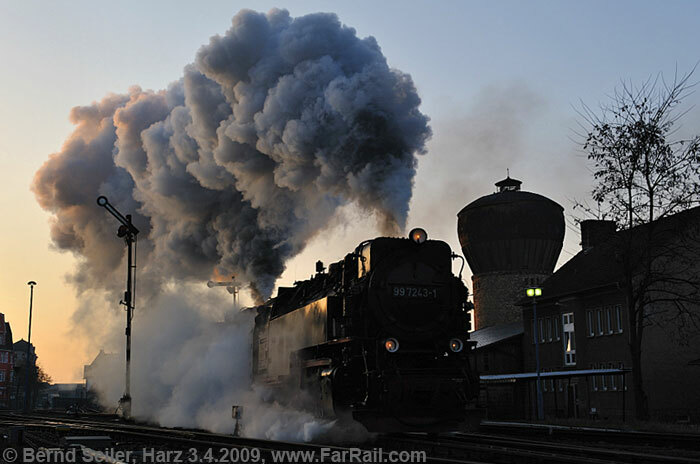 We have planned the ultimate photo and video tour to the spectacular metre gauge line in the Harz mountains. If you couldn’t make it in 2009, this is your second and very likely last chance! Trains with compositions featured in our planned specials haven’t been on the rails of the Harz mountains since 1993, except during our charter event in April 2009. This tour will be totally different from the usual tours to the Harz mountains. Since running our tour last year, the opportunities have got even better. The HSB Railway can offer an additional transporter wagon, so we’ll have seven on our double headed train. The German Railways have already said that the required number of standard gauge two-axle coal wagons should still be available at the beginning of 2010. These two axle open freight cars are the reason there won’t be another chance for a tour of this type. At the beginning of 2010, DB only had around 300 left in their rolling stock. Because of the low demand for these old-style wagons the management has already decided not to overhaul such wagons nor allow repairs. The end for these freight wagons is approaching soon. We even can’t guarantee that February 2011 won’t be too late already. 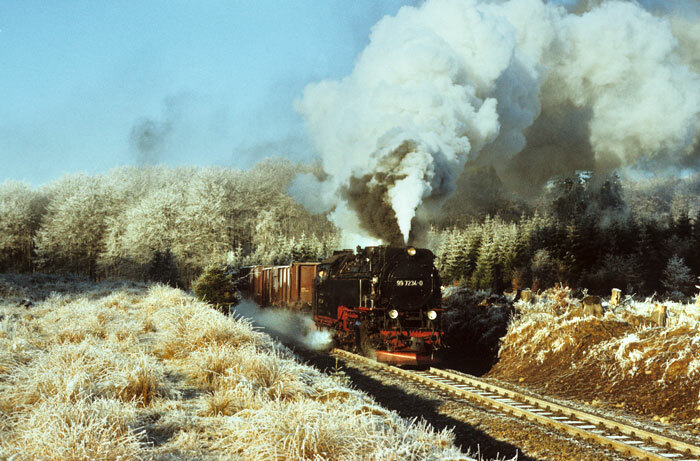 That’s why this is very likely to be your last chance to experience trains which were used on the Harz mountain railways 30 or 40 years ago. We have prepared one locomotive to look “oil fired”. This locomotive will have a cover on the coal bunker and the number changed to 99.02xx. 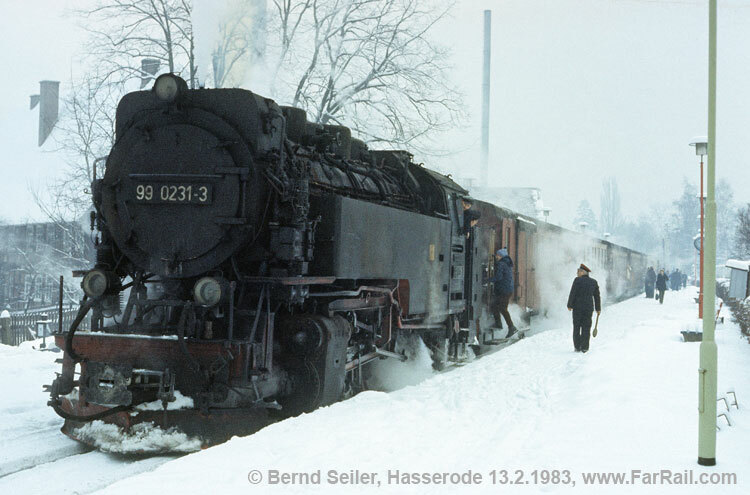 In the east German numbering system the zero behind the 99 (class) indicated that it was an oil fired locomotive. That will give a feeling of the 1980s, as almost all the Harz locomotives were oil fired. 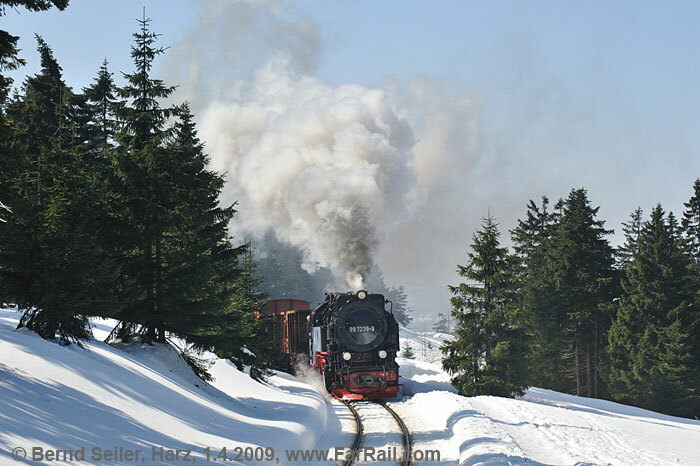 The Harz mountains are the most northern mountains in Germany and well known to railway enthusiasts. 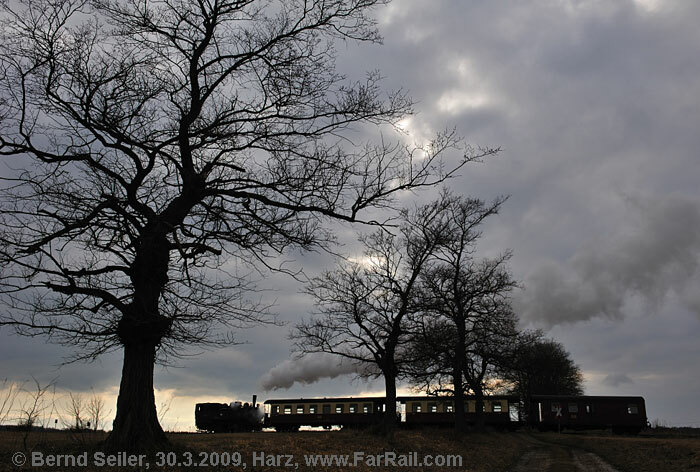 The reason is the “Harzer Schmalspurbahnen” which still operates a number of trains with steam throughout the year. 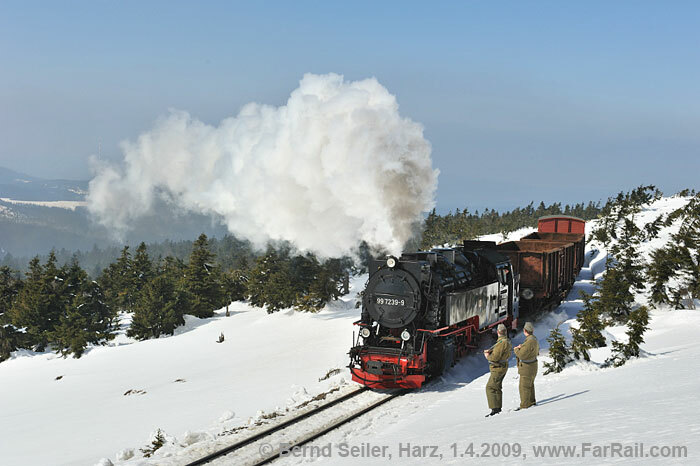 The steam trains climb the Brocken, the highest mountain of the Harz. However, for photographers and video film makers the trains can be rather boring. There are super shiny steam locomotives with side tanks suitable for use as a mirror, red-beige metal passenger coaches with round roofs and metal-framed windows, combined with concrete platforms and the flags of western ice cream manufacturers at many station buildings. It’s hard to find a reasonable photo position. Of course we have to admit that the railway earns its money with these types of trains but real railway enthusiasts prefer the old style of trains. So we’ll arrange trains that look as they did some 30 years ago. We’ll haul authentic trains and we’ll rebrand wagons and locomotives as ‘Deutsche Reichsbahn’  the former east German state railway that owned the line and the rolling stock. We’ll cover the whole traditional network of metre gauge lines through the Harz. For most of the network we’ll travel with chartered freight trains which should give you the feeling of the 1980s. You shouldn’t be surprised when our train to the Brocken is boarded by East German border soldiers with Kalashnikov machine guns. This was just what happened in the 1970s and 1980s. The few supply trains for the border troops and radio spies on the highest mountain of the Harz, the Brocken, were always accompanied by armed soldiers. When you see an east German “plastic” car, a “Trabant,” parked at one of the level crossings we’ll pass, don’t wonder either! You’re not in the wrong movie, you’ve just stepped back in time. The climax of the tour will be our double headed freight train, consisting of metre gauge transporter wagons with standard gauge freight wagons on them. For this train alone we’ve had to invest over 7,500 Pounds to make it look like the legendary freight train 67092. This train was the last train of the former East German ‘Deutsche Reichsbahn’ to have scheduled haulage by two steam locomotives. The tour will be held in mid February. This will give us the opportunity to experience real winter steam with a fair chance to have snow not only on the Brocken line. 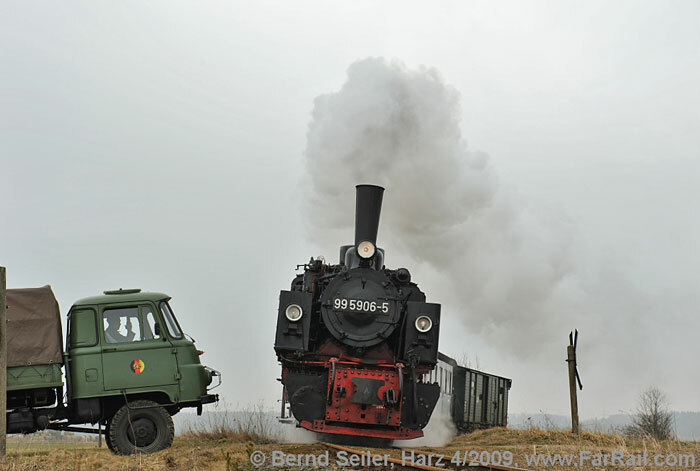 Except two, all train pictures shown here are from our Harz mountain back in time event in April 2009. For good reason we must give a warning: this tour is only suitable for participants who want to come on our train. You can book days separately if you like. But the tour is definitely not designed to suit and will not work out for car chasers. FarRail Tours cannot and will not monitor all movements of the participants and will hence not take liability for whatever happens to car chasers. In the morning we’ll take one of the black Mallets of the railway on a green passenger train. Our train will go from Gernrode to Hasselfelde. From there we’ll continue by charter bus to Nordhausen, Hotel in Nordhausen. In the morning we’ll start from Nordhausen to Benneckenstein with five transporter wagons with standard gauge freight wagons on them. After a break in Benneckenstein we’ll continue to Wernigerode, in the afternoon we’ll make a brief visit to the depot of Wernigerode where the tour ends, arrival Wernigerode around 16.30 hrs. 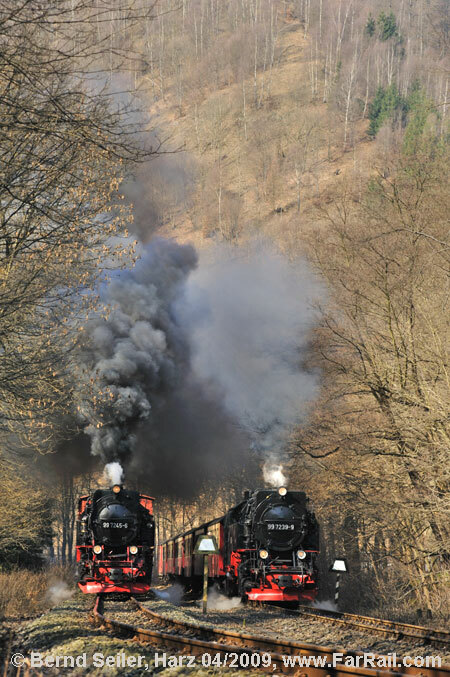 Optionally, you can extend your stay in Wernigerode and explore the regular steam hauled trains the following day(s). There are so many articles and books available about this particular line that we needn’t talk about the tunnel, the steep gradients and the beautiful countryside. But we need to say something about the photographic opportunities. Time goes on and it didn’t stop in the Harz mountains either. The formerly very photogenic run through the city streets of Wernigerode has, sadly, been refurbished in the western style. With modern cars on the streets you’ll hardly find any good photo spot here. Most of the level crossings along the line have been changed immensely in recent decades, so they are not worth a picture any more. Railway stations are another matter. There are only a very few left still looking similar to the way they were some 30 years ago. So we’ll focus on pictures in the countryside, the valleys, forests and meadows. However, there are some stations left with the demure and charms of the former German Democratic Republic and their railways, the ‘Deutsche Reichsbahn’. Of course we’ll take shots and videos at these rare stations. We’ll visit all three depots of the network. 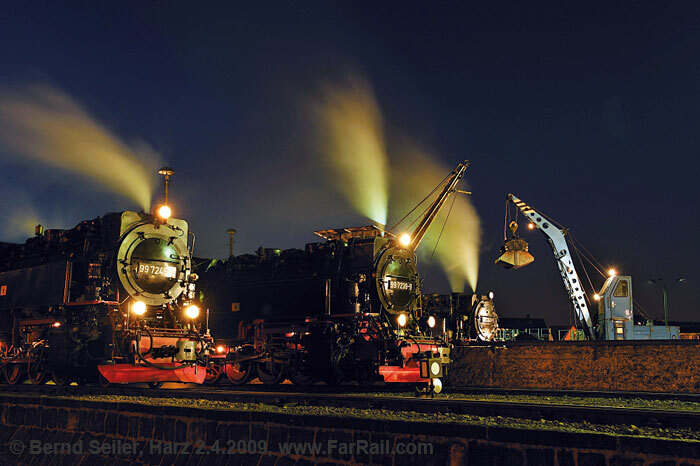 Nordhausen usually only hosts one steam locomotive during the night. Because we’ve ordered two locomotives for our freight train we have the unique chance to see three locomotives under steam here. Within the limits of our budget, we’ll try to change all possible details back to the years between 1975 and 1989. It’s hard to convince the railway staff not to polish their locomotives every ten minutes. Because of our special request, some of the locomotives won’t be cleaned for several days  and won’t be parked inside the loco shed. At least with the Mallet we’ll try to get an authentic patina on it. We’ll remove all the brass toys from the outside of the engine and we’ll make the water taps (on the side water tanks) black (instead of chrome-nickel or brass). The plates will state the locomotive belongs to the ‘Deutsche Reichsbahn’. With vinyl lettering, we’ll put the ‘DR’ (which stands for ‘Deutsche Reichsbahn’) back on the sides of the passenger coaches as well. While travelling in Germany we can’t avoid following some rules which don’t apply in some other countries. In the forest it’s sometimes not allowed to leave the marked pathways. “Gardening” in the nature reserve of the Brocken is a big no-no. There are nature rangers around who won’t think it is a joke if anyone tries to clear away vegetation to get a better photo. 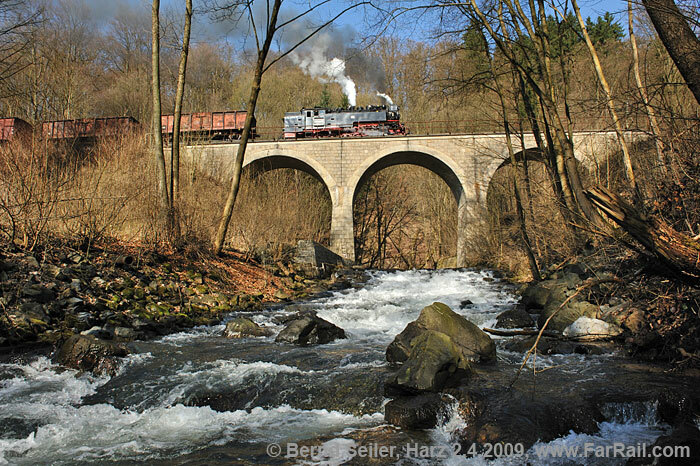 The Harzer Schmalspurbahnen (HSB, Harz Narrow Gauge Railways) can’t guarantee that everything will work as planned and paid for. We must remember that the line is going over mountains; a tree blocking the rails could prevent us from travelling further for example. Bear in mind that we are using at least 50-year-old locomotives for our trains and technical problems may occur which are not covered by any insurance. The HSB don’t accept any liability regarding delays or train cancellations. So we can’t guarantee it either. If you can’t spare the time for the entire program, you may participate for a few days only. It’s essential that you register your wish even if you only want to come for a single day. If you want to pick the day where we’ll take our double headed train, please consider this particular day will cost you 375 Pounds without hotel or food, because of the high cost of the equipment. These are the net costs for just the train. This tour is definitely not designed for car chasers. For instance, the locos will wear some “decorations” which will only be removed at our photo positions. 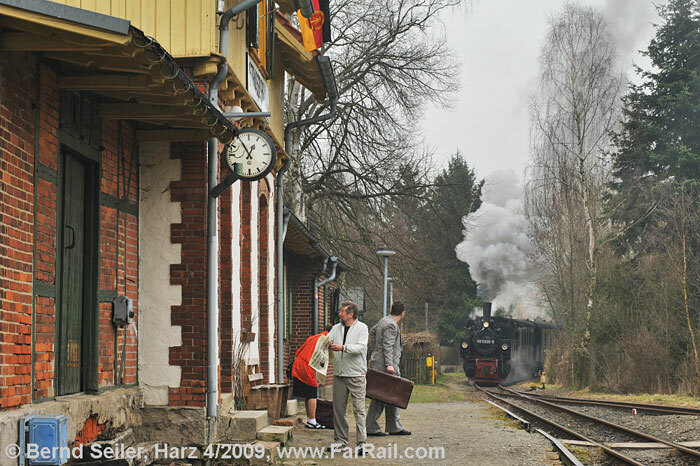 We’ve booked medium class hotels within walking distance in Wernigerode and Nordhausen (two to three minutes). In Gernrode we have a charter bus. Please expect a wide variety of weather conditions, and bring appropriate clothing. From sunshine with ten degrees centigrade above zero down to snow storms and fog with minus 30 degrees - everything is possible. The tour prices include half board except beverages. During the day you can enjoy cheap meals at the stations and, sometimes, we’ve planned a brief visit to a restaurant as well. Prices at the stations are reasonable, for example at the Brocken they’ll charge you just 5 Euros for a serving of pea soup with sausage. Spaghetti Bolognese is 5.70 Euros and schnitzel with potato salad 6.70 Euros. Please bear in mind that travelling with trains, walking through depots and stations, boarding trains and getting off at the lineside all have a risk of accidents which is not covered either by the Harzer Schmalspurbahnen (HSB) or FarRail Tours. Always use common sense when crossing roads and railway tracks. Neither the HSB nor FarRail Tours can be held responsible and will not accept any liability whatsoever in the case of any accident, damage or delay. We suggest you take out a comprehensive overseas accident and health insurance policy, and carry a small first aid kit. Contact us for the costs of participating in just part of the tour and we will let you know price and availability.